That much is certain. I think. that we need to figure out. it recedes as we approach it. So there is always the need to know more. And Allah did not send down a single verse except for ‘her’ there are Zāhir (Emergent Abstraction) and Bātin (Inmost Concealed Core).. And every Harf (Alphabet) has a Hadd (Horizon) and every horizon has a Matla’ (Place for sunrise). O my heart-throbbing love! Listen to this writer about the meaning of Alif which is one of the Mutashabihat (Ambiguities). Know that Alif is one of the Shat-h (Terse Laconic Spiritual Phrases), an Isharat (Vector) pointing at the establishment of the Qidam upon Qidam, within the Qidam and from the Qidam; the singling out of the Dhat (Divine Essence) for the Dhat (Divine Essence) and within the Dhat (Divine Essence); and the Tajalli (Lucent Manifestation) of the Absolute End upon Absolute End, the (Tajalli of) ‘Ain (Portal) for ‘Ain (Portal); and news from the ‘Ain-Jam’ (Evanescence of transience) and Jam’- al-Jam’ (Becoming/Being one with the universe) and the plunge of all sunken causalities. 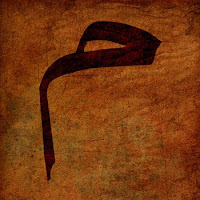 Alif is the foundation/origin for all causalities, the emergence of reality without the designs of Rububiyat (Divinity presented for Servitude) plainly in view enrobed with the gown of indefiniteness; and Ma’rifa (Unlearnt Knowledge) within Ma’rifa (Unlearnt Knowledge) while maintaining the prerequisite of indefiniteness; for Irfan (Cognizance of Divine Entities) is an unknown within the indefiniteness since indefiniteness is in reality a cut-off Ma’rifa (Unlearnt Knowledge). Alif is the foundation/origin of the Qidam. 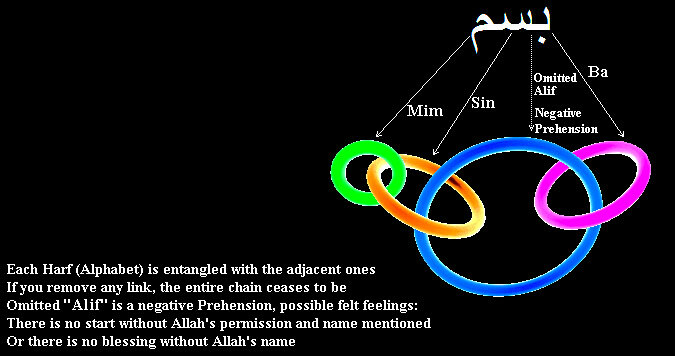 Transience due to the characterization of the Fana (Evanescence) within the outer-limits of ‘Adam (Non-Being), has no perturbing effect upon the Qidam: Because in reality there is nothing but Qidam! Alif is the primordially first Harf (Alphabetized Divine Word), for Alif does Isharat (Point) towards Allah that has caused all things to have the gravitation of ‘Alifa (Acquaintance, familiarity and intimacy) between themselves and yet Hu ITself is nonpareil nonesuch and free from any association and companionship. We confuse Alif the sounds which come out of our mouths or with a small vertical line on the paper. Indeed Alif can be confused with such trifle trivialities, but Alif’s reality is far larger than this universe. 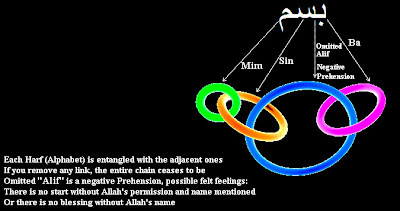 An Ishara (Vector) pointing at the establishment of the Qidam upon Qidam, within the Qidam and from the Qidam: No matter what entity we might think about, this entity should have a space to reside within as the mathematicians say, or needs to have a background field(s) or timespace to reside upon/within as the physicists say, or it needs to have an environment or habitat to reside within as the biologists say. In general all entities need to reside upon a stratum. However Alif, like a vector, points at the Qidam residing upon nothing other than Qidam itself! Qidam needs no space or fields or environments or stratum to reside upon/within. Qidam therefore resides upon within and from Qidam! And Alif is that vector that points at this Self-Stratum of the Qidam. And (Alif is the) singling out of the Dhat (Divine Essence) for the Dhat (Divine Essence) and within the Dhat (Divine Essence): In order for an object to be discerned, there is need for a background so that it can be contrasted against. When you try to take a picture, you focus the lens until an image is formed with maximum contrast with the background. Dhat (Divine Essence) has no background to be contrasted against in order to be discerned as a separate entity, except for Dhat/ except for itself! And the Alif, again as overflowed water from a damn, overflows into this universe, into our hearts and minds to help us understand how the Dhat (Divine Essence) contrasts against itself. And (Alif is) the Tajalli (Lucent Manifestation) of the Absolute End upon Absolute End: Absolute End or the Farsi Kunh is a Sufi Farsi word for the absolute reality of the Dhat (Divine Essence) i.e. the realities beyond which there are no other realities. At that infinite depth of the sea of realities only a flash of light can help in order for anything to be seen! That flash of light in the dark hadal depth of the sea of realities is called Tajalli (Lucent Manifestations). Therefore Alif is like a directional/vectorial flash of light in that infinite depth, letting the last of the realities be exposed to each other, and letting us see that depth from where we are in this universe. And (Alif is the) emergence of reality without the visible-expressions of Rububiyat (Divinity presented for Servitude) plainly in view enrobed with the gown of indefiniteness: This whole sentence is the very definition of Ahad, the Divine Name as in ‘Say Hu (IT, HE) (is) Allah Ahad’ [112:1]. Indeed Alif is the first letter of the Ahad. Ahad normally means one, but it is not one as in numbers and counting, but it is one as in the meaning of the essence i.e. it describes a fantastic modality of the Divine Presence wherein there is nothing, no creature or knowledge, nothing save Allah. Therefore Alif is the appearance of the reality of Ahad, minus the worshipers in servitude, and this reality is enrobed as an indefinite entity i.e. the word Ahad is missing the definite article ‘Al’ as in Al-Rahman (The Beneficent) or Al-Rahim (The Merciful). This lack of article Al (The) is the core signature of the Divine Presence of Ahad as an indefinite Divine Entity. You can imagine this indefinite by pointing i.e. if something is definite then you can point to it somehow, but when it is indefinite you cannot point at it in any form or fashion. Therefore the Alif is the very emergence of appearance of this peculiar indefiniteness! And (Alif is) Ma’rifa (Unlearnt Knowledge) within Ma’rifa (Unlearnt Knowledge) while maintaining the prerequisite of indefiniteness: Ma’rifa is knowledge about a specific entity, a knowledge that has no opposite i.e. ignorance; it is a knowledge that has no learning associated with it; it is a knowledge that is out of the passage of time i.e. whomever possesses it believes that he has had it forever and there was no time when he did not have this Ma’rifa. ‘While maintaining the prerequisite of indefiniteness’ can be best translated into the modern term of ‘abstraction’ i.e. different Ma’rifa appear within other Ma’rifa(s) as abstract forms, however in a most indefinite way and that indefinite abstraction’s origin is Alif. Example, when we say God, there is no place we can point to in order see God it is an indefinite abstract concept, however it is as real as the creator of the universe and its administrator! And again none of the words ‘creator’ or ‘administrator’ are definite! 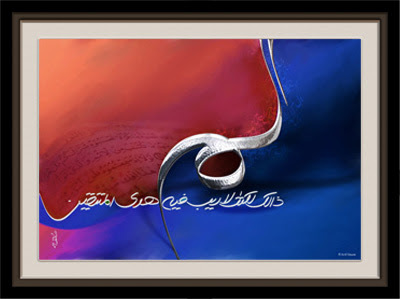 Alif allows us to understand the concepts of these indefinite abstractions. For Irfan (Cognizance of Divine Entities) is an unknown within the indefiniteness: Irfan is full cognizance beyond doubt and free of incompleteness. Therefore Irfan cannot deal with the indefiniteness; if it could then the indefinite would become a definite. Therefore so far as the indefinites are concerned, Irfan (Cognizance) is an unknown. In modern terms this form of Irfan (Cognizance) is incomplete i.e. it can only partially help the intellect to cognize a Divine Knowledge. Since indefiniteness is in reality a cut-off Ma’rifa (Unlearnt Knowledge): Imagine that all Ma’rifa forms a unit. Now imagine that a piece of knowledge was cut out of the ensemble. This knowledge can be best represented by something indefinite e.g. imagine that amongst all knowledge about fruits, knowledge about the apple was removed from all sources of knowledge. Then despite the fact that the apple continues to exist, no one can clearly see it for sure or know about it for sure; the most that can be said about the apple would be a few indefinite descriptions e.g. it is round with seeds at the core and so on. This indefiniteness is caused by the 'cutting off' of the apple Ma’rifa (Unlearnt Knowledge) from all sources of knowledge'. In sum, definite objects can participate in the causalities dealing with each other, but when an indefinite object needs to participate within the causality it is made into an abstraction of some kind and at that end: Alif is the source of all causalities and is again the source for the abstraction of all indefiniteness. Applied to the Divine Presence: Alif is the source of the causal universe and its facts of relatedness, yet the same Alif is also the source of the abstraction of Ahad (Divine Oneness without any other existence) an Indefinite mode of Divine Presence. Harf (Alphabetized Divine Word) Lam (The ‘L’ sound) is a prehension, where Wujud (Being) prehends the Qidam with incredibly rich and variant subjective-forms. Note: Subjective-form roughly means the how-ness by which the Wujud (Being) feels or accomplishes the prehension of the Qidam. ‘Prehending Qidam’ means the Wujud's (Being’s) concrescence includes the Qidam (or members of Qidam) somehow and the term ‘somehow’ is the subjective-form. Without the participation of the Qidam or members of the Qidam there could never be any Wujud (Being). 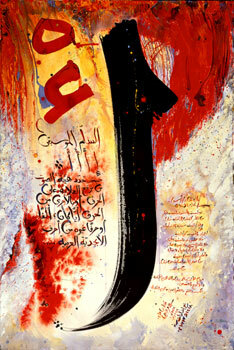 No matter who or what prehends the Qidam, and no matter how at that, there is always a feeling of past-tense to Qidam! Example, we see an apple on the table, the very act of seeing the image of the apple, and thinking about and remembering what apple is, are indeed processes operating upon an object that was objectified in the recent past. 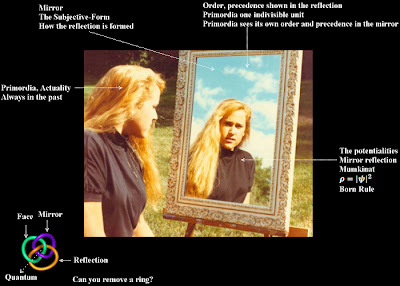 If an object is objectified then its actualization is always in the past. 16:1 Came the commandment of Allah: Setting the past tense for an event that will realize for certain in future; the commandment of Allah is the Day of Judgment and Majaz is applied to its verb ‘came’ by setting it to the past tense, to guide the mind of the listener to the inevitability in future. 36:51 And the trumpet was sounded: Again the time is set vis-a-vise the past tense of the verb ‘was sounded’ to indicate the imminent event; as sure as an event that happened in the past, thus using the certitude of the past events as the corridor to traverse to the certainty of the future event of the Day of Judgment and hence the Majaz. 5:116 And when Allah said to the Jesus the son of Mary “Did you tell the people to worship me and my mother”: Allah will ask for sure in future if Jesus did order people to worship him and his mother and again the past tense is a passageway for the mind of the listener to the actuality of the future event. 14:21 And they appeared before Allah collectively: The past tense of the verb appeared indication of the certainty of the event in the future, as the certainty of the past events are lodged within the human intellect. 7:48 And the companions on the heights called some men: ‘called’ the assured eventual happening of the ‘shall call’. Therefore we realize that in general for Wujud (Begin) prehending the Qidam, the subjective-form is the feeling of the past. Indeed this feeling of the past is often felt as an ‘age’ in both quantitative and qualitative sense. For the sake of consistency we call this feeling of ‘age’ as the ‘amplitude’. It then easily follows that Al-Qadim is prehended by the age or the amplitude of infinity! Or Al-Qadim the oldest the most ancient. Given this amplitude of ‘age’ then the Wujud (Being) here in this transient nascent universe can ‘rank’ the members of Qidam it prehends i.e. precedence established as before and after in time. Note: With the exception of the Al-Qadim the age precedence of all actualities within the Qidam can only be established via an external Wujud (Being) in this transient nascent realm. Therefore this world is a mirror off of which the Qidam sees its own order and precedence. Until less than 100 years ago we had no idea how human beings are linked to each other, now through the molecular science of Genome we all know and very well know how people are linked in past and in future. Mim is the prolonged phoneme/letter that links the first and the last Prophet, both spiritually and genomically, Muhammad was a Nabi (Informer) informing through the radiation of Nur-Muhammadi, a peculiar form of Nur (Divine Light), from extremely close sanctified nearness which in this Surah we hear as Sabbihi. In return Adam acts upon Muhammad in a molecular causal fashion i.e. 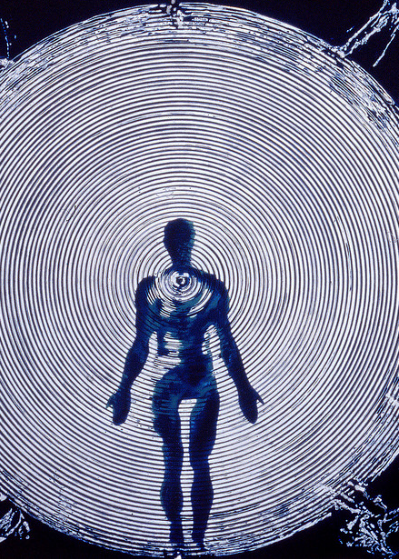 via his genome and thus the two form a close loop or a circle.